The Amaze is just that, amazing to use and perfect if you also want an easily portable scooter with the ride time needed to do a whole day at a Disney World, Universal or Sea World theme park. 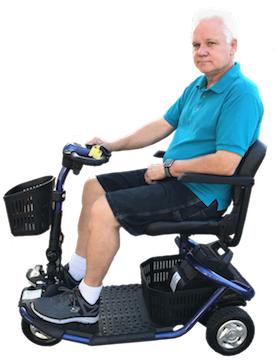 It has a 12-15 hour theme park usage ride time for up to 275-pound capacity and has the industry standard 18-inch wide seat. It fits in the trunk of a car and on boats, buses, and monorail. It is easy to handle whether you want to simply maneuver it into a tight space in your hotel room or fit in a rental car or even very small mini-van trunk. The Amaze also has a convenient battery that can be charged without bringing in the entire scooter! The Amaze comes with a front basket plus an additional under seat basket, built in headlight for your nighttime riding, upgraded batteries (standard batteries just won’t do) and upgraded fast battery chargers (no additional cost to you, of course). You can charge the Amaze in 5 hours from dead flat. We always recommend you bring your charger with you to the theme park just in case you have more fun scooting around than riding the rides! Just plugging in for a hour during a lunch or dinner can give you back 20% of your battery power. The Amaze has it’s own key and comes with a coil wristband for easy keeping. And all our keys are only Scooter Vacation keys and the key locks are the best water-resistant available. We have 24-hour customer service while you are on your scooter and it is always a Scooter Vacations person that answers your call, no matter the time. If it is 3 in the morning the on-call person will wake up and take your call! No other scooter rental company offers this level of service. Rent the Amaze it is easy to drive and easy to put in a car if you so desire.